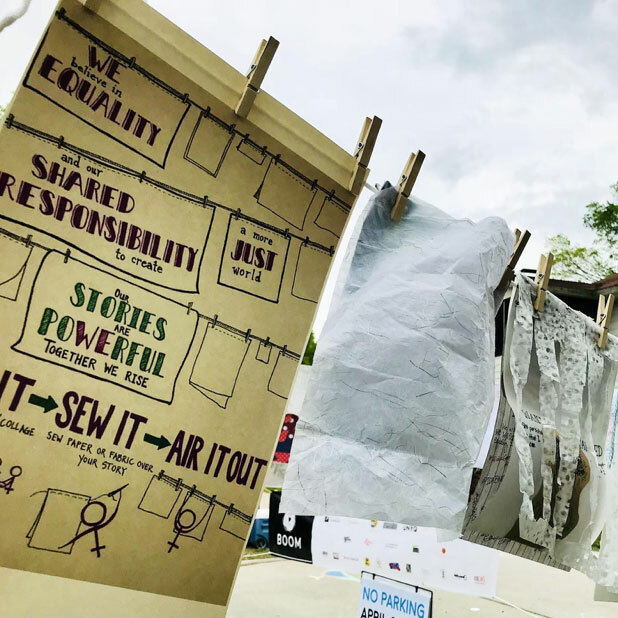 “Airing Out the ‘Dirty’ Laundry” is a traveling exhibit about strength, unity, and resistance of oppression, injustice and exclusion. All women (including non-binary individuals) are invited to participate in this ongoing project. As women, our voices are often silenced. Airing Out the “Dirty” Laundry Airing Out the “Dirty” Laundry is an ongoing, participatory art project that invites diverse communities of women—including cis women, trans women, trans-femme, and non-binary people—to share their stories through visual storytelling, which are then installed in public spaces to engage the broader community in dialogue about equity and justice. 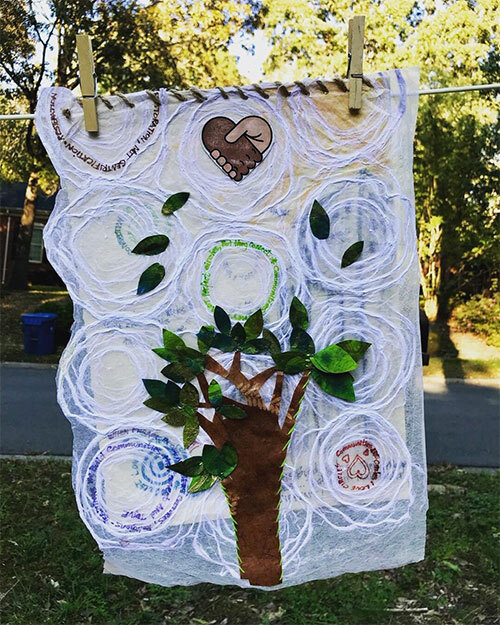 The top layer sewn over each piece of “dirty” laundry flows freely and is meant to be lifted as an invitation to dialogue about our experiences and hopes. Materials are provided, but people are encouraged to bring articles of clothing, fabric, and other personal items that can become a part of the piece. When we reveal our stories, we create the possibility of shifting the narrative. Andrea Downs is an artist and an activist who has taught for 15 years. She creates work that is designed to foster collaboration, connections, and deeper dialogue across different segments of the diverse communities within which she lives and works. Bunny Gregory is a local painter and the beautiful mind behind The Underground, and The Underground Mobile Gallery–bringing amazing visual, musical, poetic, graphic, and historical works from local and accessible black artists to our Charlotte lower-income neighborhoods.